Poor Damsel...her life was so perfect back at the castle, riding her pony, brushing her hair and visiting the spa. But now her royal princessliness has been kidnapped by the quasi-evil, fat little middle aged wizard Dorkus, and trapped high in a tower with no doors! She's held out as long as she can, but if she doesn't escape tonight, Dorkus will force her to marry him! What's a girl in distress to do? Well, wait for rescue, obviously. But when rescues go wrong, Damsels must do it for themselves! If you get lost, Damsel also has an in-game hint system on the control menu! Check it out! Thanks for downloading, and we enjoy hearing what you think of our games! Please remember to vote! Have fun! Very fun game. The dialog was hilarious and the puzzles were really silly. I had a lot of fun playing it! Definitely looking forward to a sequel! Great voice acting and a cool story, but very short and the puzzles were to easy for me. Funny as hell, hope there's really more of it to come. Music works well by the way congrats to the man who did it. hmm its all right, i got it from a magazine disk :) the voices were ok but not the best. its quite funny nice satire and the graphics were alright. Somehow I'm not as excited as everyone else about this game. The history was OK, but cliched. Although the graphics were very descriptive, they don't stand out. The jokes didn't make anything for me, and the puzzles did not pose a challenge. It's always nice to play a game with voice overs. Dorkus' is pretty well done, however I found all other characters, especially Damsel's, quite annoying ― I understand Damsel sounding like an annoying teenager is sarcasm, but still. This was a very cute and enjoyable little game. 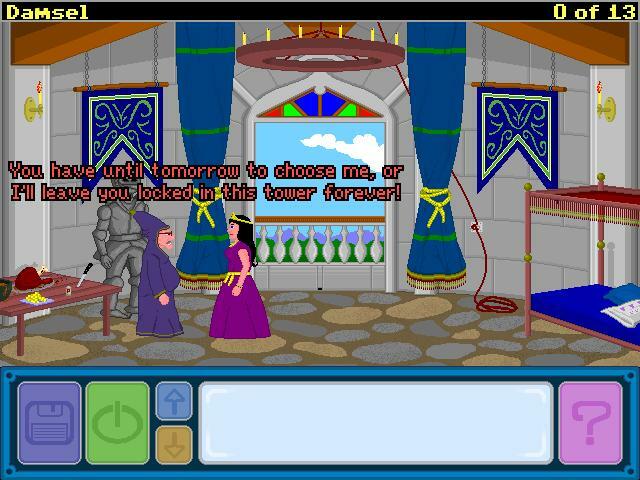 The graphics and animations were lovely, as was the playful parody of the "princess stuck in a tower" element. The voice acting was enjoyable as well. A Brilliant short game with great graphics and music. Short does not mean boring with this game. I played through it twice. Download it and play it right away. That's a really funny game. The graphics are nice, the dialogs are ridiculous and there is a nice medieval soundtrack. Also the voice acting is very good and the animations add to the cutscenes. Well done! I hope there will be more episodes soon. I definitely recommend this game to everyone. It will give you a hilarious and happy half an hour! Just finished playing, and I loved it! It made a major impression upon me, good stuff. I loved all the voices, but especially the stuff from Jesse Cox. Thanks for the good half hour of awesome entertainment! This is a fantastic short adventure. It's more than enough to make me want to play any sequels. A beautiful, nice and entertaining game. I voted "no puzzles" as they were rather simple; that didn't stop me enjoying it though!